A Director of MI5, in the wartime propaganda department, talking about the holocaust propaganda said "is was as a wheel, spinning so fast that nobody dared put a hand to it, to stop it, as they would get burned"
This could account for the 'late start' of, and show the 'political power' infesting the racket. "The biggest lie that we propagated, as far as I can see, was the gas chamber lie. And once again we are quoting from the archives. They are in the British archives, how the Psychological War Fare Executive decides quite cold bloodedly and cynically to start putting out over the radio waves, the allegations that the Germans have built special gas chambers for gassing the Jews and getting rid of them. And later on in the files, round about 1944. we find the 'Chairman of the Joint Intelligence Committee', who was responsible for the 'Psychological Warfare Executive', writing a hand-written minute, his name is Victor Cavendish Benting, an emminent banker, an industrialist, still alive in England now, Lord Portland as he is now, Chairman of the Joint Intelligence Committee, writing in hand-writing in 1944, words to the following effect. "We've had a good run for our money with this gas chamber lie, but really, we have got to be a bit careful because eventually its going to be exposed and then our entire psychological warfare effort will be brought down with it. So isn't it a bit... isn't it a good time now to distance ourselves from this particular story. We've set the hare running, now we ought to let it go off by it'self". A good run for their money in 1944 and here we are in 1988 and that hare is still running 44 years later". I spelt his name wrong, it is, Victor Cavendish-Bentinck. 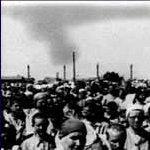 The report, which said 1,000 Jews a day were being gassed, was based on information from the Polish Underground. But it was not believed, even among those who were privy to the codebreakers' reports. Victor Cavendish-Bentinck, the chairman of the Joint Intelligence Committee, complained that the Jews exaggerated what was happening "in order to stoke us up". Well, he would know, wouldn't he. He started the ball rolling and the Jews jumped on board and started 'stoking it up'. He was getting a good run for his money. Unfortunately he was not able to stop the propaganda. I have no doubt it is as Irving said: 'The evidence is in the archives'. You can listen to or get David Irvings speechs here. prepared written testimony for the Irving trial. At the conclusion of this report (in which he dismisses Bentnick's skepticism and the skepticism of most British citizens in general about reports of homicidal gassings in German and Polish concentration camps) he mentions a l945 forensic report prepared by Jan Sehn and Roman Dawidowski as proof of the stories of gas chambers, at least at Auschwitz. Who were these "experts"? Do Leuchter and Rudolph address their findings? i)Has it been proven beyond reasonable doubt that Auschwitz was equipped with homicidal gas chambers,and has it been proven beyond reasonable doubt that these gas chambers were systematically used? The answer is yes:the ";intentional evidence " given by former inmates and the most important perpetrators is corroborated by the ";non-intentional evidence " provided by the documents in the archive of the Auschwitz Central Construction Office,the results of the forensic investigations done in 1945 by Jan Sehn and Roman Dawidowski,and the testing of samples of the walls of the gas chamber of crematorium 1 and the ruins of the gas chambers of crematoria 2,3,4 and 5.The attempts by Holocaust deniers such as Rassinier,Faurisson,Butz,Stäglich and Leuchter to discredit the evidence on the basis of hermeneutic analysis of ";intentional evidence " and scientific analysis of the ";non-intentional evidence " has been shown to be of little or no significance,,and do not discredit the overwhelming evidence that converges on the conclusion that Auschwitz was equipped with homicidal gas chambers and that these gas chambers were systematically used. Charles Krafft asks for Revisionist debunking of shyster Van Pelt , no problem, piece of cake. There's even more at this Forum, search Van Pelt and see. So Halden's search for a source of the quote from Cavendish-Bentinik in his earlier thread about purpetuating the Auschwitz gassings lie ends up (via David Irving writing in German at his website) with an uncited paraphrase by Paul Norris, an associate of Ernst Zundel. No references to the source of this quote beyond Norris are provided. Apparently, it's not worth bothering with and proves nothing. In researching Jan Sehn I learned that he was a judge at one of the Auschwitz trials and that the Jan Sen Institute in Poland prepared a forensics report for The Auschwitz Memorial Museum after the Leuchter Report appeared. After hearing about this report Mark Weber of the IHR wrote to them for an appraisal of their findings and was told, in so many words, that they were inconclusive and further testing needed to be done. There has been no follow up on any further forensic testing at Auschwitz by the Jan Sehn Institute from Francizek Piper or Mark Weber. I could not find anything on Roman Dawidowski. I doubt that the British archives will ever reveal the truth. This is too important. They will be destroyed and have probably been already been destroyed. The British have done this with other WWII matters which do not paint them in a good light. Note that the "truth" about the gas chambers is consistently claimed to be the ridiculous "eye witness" stories and the "confessions" which would not stand up in a legitimate court! Nothing else. Pressac's impact on the historiography of the Auschwitz camp is well known, so I will not repeat this here. But to be quite honest, I have to point out that the main aspects of his research (the so-called "criminal traces," which in his opinion prove the existence of homicidal gas chambers at Auschwitz) go back to Roman Dawidowski, who listed most of those "traces" and quoted many of Pressac's documents in his expert report concluded on September 26, 1946, in preparation of the Höß-Trial. Pressac's impact on the historiography of the Auschwitz camp is well known, so I will not repeat this here. It's always good to repeat Pressac's conclusions. "As evidence to establish the reality of homicidal gassings there remain only the testimonies of participants,[...]"
As I wrote somewhere else, We know what the Egyptian mummys had for breakfast over 2000 years ago, so Pressacc is just trying it on. He tells us, no material evidence exists, and then expects us to fall in line with testimony. Pressac has it backwards, there is a heap of good solid evidence for the building not being a gas chamber. I think Pressac has been studying Freud or some other wierdo for too long. His brain works backward. He needs to tell us how the 'eye witnesses' can match their stories with the evidence or non-evidence as the case is. Good solid evidence is the Rudolf Report, The Leuchter Report and plain ol' common sense. The building only had one door, 'factory of death', ya just gotta laugh. And from here we go nowhere, if gassing did not take place here then it did not take place anywhere in Auschwitz. Case closed. There was no holocaust. Can anyone direct me to what is called by exterminationists the "Soviet-Polish act" of Jan Sehn and the report of "traces" found at Auschwitz in l946 (or before) by Dawidoski? I want to examine the earliest forensics available. made for homicidal gassings at the Auschwitz trials and exterminationists reference documents submitted by the above named persons as the proof. Hannover. maybe I've been reading too much Freud, but if someone asked me to direct them to information that may refute what I am saying, I would tell them to go get it themselves. )Has it been proven beyond reasonable doubt that Auschwitz was equipped with homicidal gas chambers,and has it been proven beyond reasonable doubt that these gas chambers were systematically used? You see, I only know things as TRUE or FALSE. I do not know things as 'intentional' or 'non-intentional'. I leave that for the talmudists. I did not hear the words, true, proved, factual. Charles, are you a wolf in sheeps clothing?